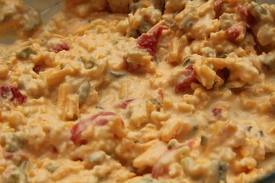 I’m from Charleston, South Carolina and we LOVE our Pimento Cheese. Use it as a dip, stuff it in Chicken Breast, top off your burger or use it for grilled cheese. with diced pimientos (roasted red peppers). (Found in the pickles section). Add enough mayo to bind. For xtra oooomph add diced jalapeno peppers. This entry was posted in Appetizers, Beef, Chicken by Modern Mom Meals. Bookmark the permalink.